Probably the most loved and sought after Lilium species, early Christian art often used Lilium candidum , the Madonna Lily, as a symbol of the Virgin Mother and her purity. Even now, it is still widely used as a symbol of chastity and innocence. It is believed that ancient Egyptians not only cultivated Lilium candidum for its beauty, but highly regarded it as a medicinal necessity. So widely spread and loved by the early 1800's, Lilium candidum was used in a cross with Lilium chalcedonicum , a native of Greece producing the first recorded hybrid Lilium x 'Testaceum' which is found in commerce still today nearly 200 years later. The dazzling, pure white, outfacing flowers have bright yellow pollen and heavy fragrance, very similar to that of honeysuckle. Contrary to other lily species, they require shallow planting with only a scant inch of soil above the bulb and an alkaline soil. Their habit of producing a rosette of leaves during the late fall and winter months does not allow easy weed control on a commercial basis. With most bulbs now coming from Israel, many have unfortunately been dug in the wild to satisfy commercial demand and the failure rate is exceptionally high. 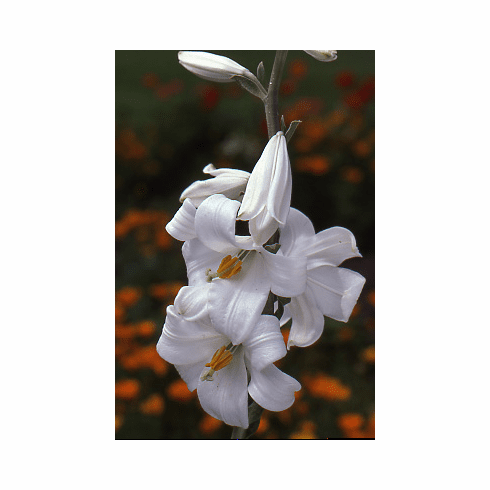 We understand from customers that bulbs recently purchased as Lilium candidum have turned out to be nothing more than a spotless outfacing white Asiatic hybrid. Very long lived and most famous is the 'Cascade Strain' developed by Jan DeGraaff and released in 1948. It can still be seen in many older cottage gardens a half century later. Fairly easy to grow from seed. Photo inset #1 is an early photo of our daughter Anne Marie inspecting a stand of L. x 'Testaceum'. Photo inset #2 came from the Bill & Marry Hoffman collection of photographs from Edgar Kline. This photo is nearly 70 years old. Photo inset #3 is of a bed of the 'Cascade Strain' L. candidum x L. candidum var. salonikae photographed by Edward McRae. Photo insert #4 is of wild 'L. candum' taken in Wadi Kelah, Mt. Carmel, Israel. Courtesy of Wikimedia Commons credited to Gideon Pisanty.